Organized by Malmö Konsthall and Lunds konsthall in cooperation with Deichtorhallen Hamburg, “POUL GERNES – Retrospective” exhibition will be held at the Malmö Konsthall from May 21st – August 21st. 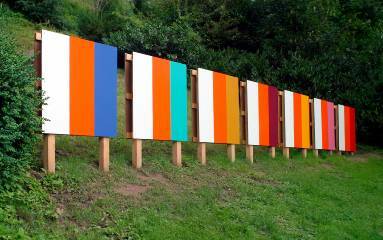 The painter, sculptor and filmmaker Poul Gernes (1925-1996) is considered a modern classic and numbers among the most influential of Scandinavian artists. He constantly sought to link art to life by means of colour and design. In the 50 years Poul Gernes was active he had numerous exhibitions and he shaped the face of more than 150 buildings in Denmark. He left behind an impressive ›uvre, which is fascinating on account of its extraordinary complexity.